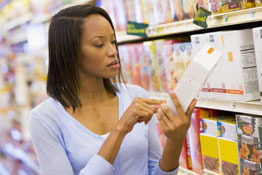 Reading labels on foods is a great way to make sure you get the most nutrition for your dollar. Watch your intake of fats and sugar, and compare amounts of nutrients like fiber, iron and calcium. Ingredients are listed from most to least. In other words, if sugar is the first ingredient, you know that the food is mostly sugar! It is good to check the ingredients list of foods like cereal and juice, and other foods that often contain added sugar, fat and sodium.